When welcoming new year or special moment or event, commonly, we will buy new clothes. This habit, of course, will make our commode full with the used clothes. We may let these old clothes to be in our commode. But when we always do it, may be we must add new commode to place our new clothes. It also happen to me and I realize it when I see that there are some clothes that actually I and my kids never wear them again. Firstly, I select one by one which one of the clothes that still can be wore and which ones that cannot. After selecting these used clothes, I place them in the boxes and put them in the shed. Actually it is a pitty to place them there, because actually it just will make full the shed with some used goods. So, I think to donate old clothes to one who still can use those old clothes or get money from these old clothes. Firstly, I would like to recycle them to be something that can be used again or modify them, then sell them. This way will help me to get cash for clothes. Beside that, I can make cash for clothes at flea market. This will be simple way, because I do not need to do anything for them. Just bring them to the flea market, and I can get cash for them. 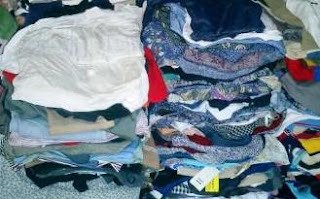 Facing this problem, I hope that I can find a place that may do cash for clothes online, in which will support me in overcome my problem related to these used clothes.